I puzzled a little over the date of this Dinkie-sized Wyvern Princess set until I removed the tray from the box and found all the paperwork inside – instructions, guarantee and the original sales receipt, dated September 1951. With their engraved caps, nestled in their plush box, this set would have made a very acceptable gift. They don’t look like the output of a company within five years of dissolution, but thankfully for all concerned, nobody in the fountain pen industry saw quite how bad the future was going to be. The pen is the simplest form of bulb-filler, though it nods in the direction of modernity with its semi-hooded nib. The pencil is – forgive my ignorance of the subject – a pencil. It has lead in it and works well. There’s an eraser still in place but by the look of it, it won’t work too well. 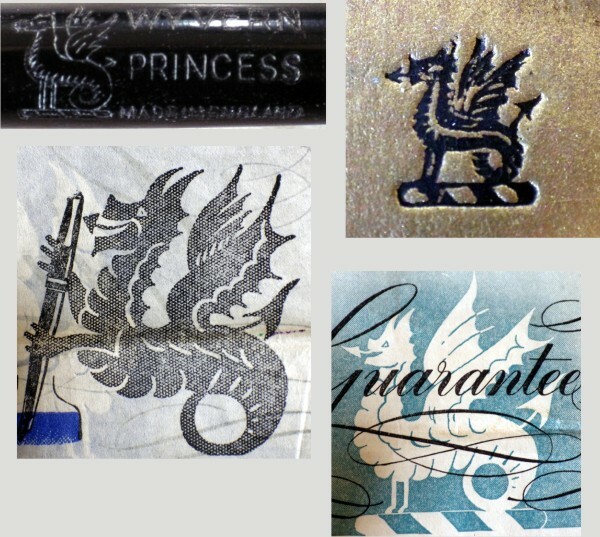 Between the pen and pencil, the box and the included paperwork, there are a number of images of the Leicester Dragon that Wyvern employed as a trade mark. I don’t know much about the Leicester Dragon or Wyverns either. It looks a very cheerful beast and it’s hard to imagine it roaming about the countryside torching villages and chomping on the occasional maiden. I am pleased you posted this pic, I had a similar set, perhaps a little earlier by the nib design, in what I can only describe as being in Toffee Marble. It ended up in Florida as I gave to Sumgaikid on FPN as a thank you for finding a Vacumatic clam shell box for me. 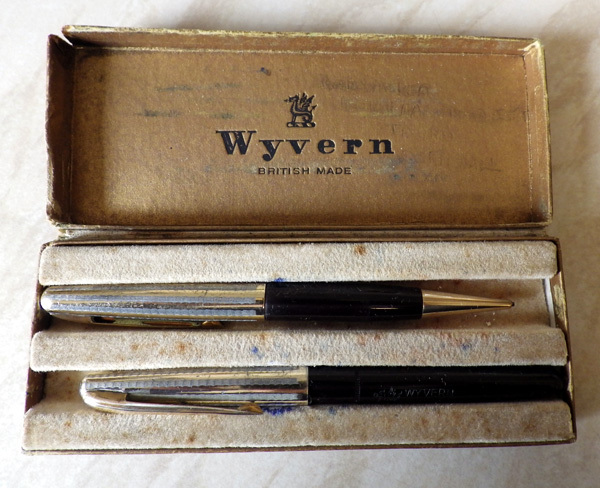 It remains a very bad habit of mine in seeking out a matching pencil and a contemporary box.